Sometimes I think about how many great experiences people have that I probably never will. Some lucky people, for example, get to see a baby gray whale up close. 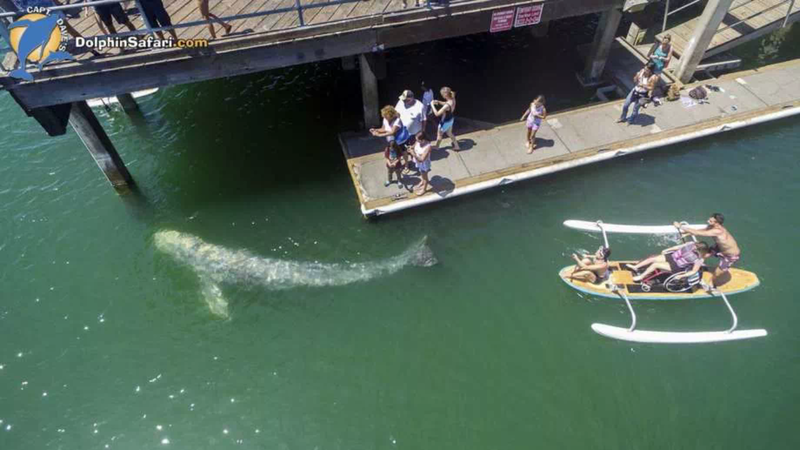 This aerial photo provided by DolphinSafari.com shows a baby gray whale in Dana Point Harbor, seen during Captain Dave’s Dolphin and Whale Watching Safari in Dana Point, Calif., Tuesday, Aug. 8, 2017. The whale, about 15 to 18 feet long, swam into a shallow children’s area called Baby Beach and circled a pier. Kayakers were able to get within a few feet of the animal, which at one point swam under paddle boarders. Some had seen UFOs, Bigfoot, aliens, angels, or ghosts. Some had won or found money, two yolks in the same egg, and so on. Not many had physical evidence or relevant checkable facts, so I’d just empathize, enjoy the stories and keep them in the back of my mind. Then I would wonder if they were just being shy for one reason or another. Those types are the people with the wildest experiences, right? Sometimes a stranger who investigates improbable oddities is better than a friend for these kind of things. As I walked on the narrow mountain road, stepping aside as logging trucks came around the corners, the surroundings got less familiar and I eventually pulled out a map app. What the..!!? I had been transported. The physical displacement of 1.1 miles seemed impossible for the time I’d been walking. I turned around and walked back on the road from which I’d come, but it was an unfamiliar road. The logical explanation turned out to be that I overshot my destination, but there’s no way I walked an extra mile in such a short time … and what about that White Rabbit with a pocket watch by the side of the road? « Who Survived More Lightning Strikes, Roy Sullivan or Melvin Roberts?